At the heart of terrorism is money. It's not just the bombing materials that need to be paid for, but the housing and food for the cell members. 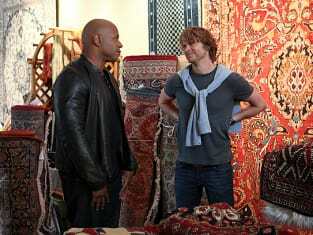 In NCIS: Los Angeles Season 5 Episode 13, NCIS tracks down terrorist cells in Afghanistan and LA through their money transfers after a FinCEN agent is killed while investigating the illegal money trail. Even though Kensi and Granger are in Afghanistan, they were able to work with their LA team members on this case. There may not have been any progress on the White Ghost case, but at least there was some interaction between the team. The relationship between Kensi and Deeks continued to be at play. It was adorable to see both Deeks and Kensi freshen up before their joint team video calls. Though, both times the partner on the call was left disappointed when their counterpart was absent on the other side. Instead of giving up hope, they each sent the other a "selfie." The photos were perfect. They looked amazing. When Kensi and Deeks are finally reunited, it better to an epic moment. I fear that it will be a tragic or strained reunion given their missions though. The distance between them has definitely made added to their spark rather than diminishing it. The case of the weeks this season have been a bit of a mixed bag, but I enjoyed this one quite a bit. It made sense for the two halves of the team to work together on this. The breakdown of how the terrorists were funding their operations through Hawala was educational. It must be incredibly difficult to track those types of money transfers. The highlight of the hour was Ehsan Navid. He provided a little comic relief, but it was his passion for America that was commendable. He was willing to do whatever was needed in order to protect his new homeland. He had a youthful exuberance that was admirable. I'm not sure how many natural born citizens would have been as energetic or helpful as he was. When Navid was surprised with a naturalization ceremony of his own, I had tears in my eyes. He wanted it so bad, "I don't need to repeat. I know it by heart." Wow. A true American hero. He helped protect and serve the country and was appropriately awarded American citizenship. It doesn't get better than that.